This week the existing lobby for the animal hospital as well as the small animal hospital parking lot, which closed the beginning of last week. With the parking lot demo, the tree removal will finish up and existing brush will come out too. As the clinic gets incorporated with the existing animal hospital, crews will push through the rain to complete the exterior waterproofing and begin the brick veneer. Things will be short and sweet at the lecture hall this week as crews continue with roofing, which is the only major project taking place at the lecture hall this week. Remember to check out the schedule and photos to stay up to date with the Magruder Expansion. This weeks work will take place solely around the lecture hall and the clinic. If you haven’t already noticed, the main parking lot of the small animal hospital is now closed and will remain closed through the end of August. For those trying to access the small animal hospital, designated parking has been added across the street in the B1 section of lot 3284 (Truax Indoor Performance Center). At the Lecture Hall, the interior framing will go up and be completed by the end of the week. Waterproofing for the roof installation is planned to continue this week, but will be dependent of the rain holding off. Also the interior utility rough-ins for mechanical, electrical and plumbing will get started. The major work at the clinic starts with the continuation of the exterior waterproofing and starting to sheet rock the first floor. It’s on the schedule to finish out the utility rough-ins and insulating piping and ductwork by the end of the week. As well as finishing up the installation of the flashing. After last weeks snow postponed construction for several days, the crew are getting back out there and working hard to get caught up with last weeks schedule. It will be a busy week at the clinic, the exterior stub walls will continue to go up as a continuation from late week and will carry over into the following week. Also over the course of this week crews will be working on the concrete pour for the stairs. This wonder sunny spring weather that we are starting out the week with will be perfect for the weather dependent roofing. We are keeping our fingers crossed that the snow is done for the season! Finally, the electrical rough in will begin on the second floor at the beginning of this week and is anticipated to take a couple of weeks. Things will also be busy at the lecture hall building as we come out of our snow days. the framing of the lecture hall will continue into this week and next, as will the installing of the piping for the fire suppression system. Though it is plan to be wrapped up by the end of the week. The current weather will also be helpful at the lecture hall as they plan to start the weather dependent roofing this week. After all of this, the lecture hall will start to look more like a building than its current black-boxy form. 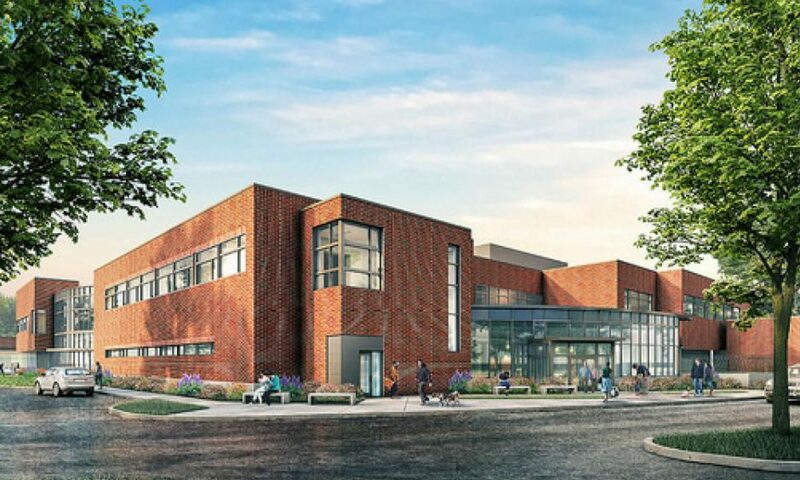 That’s because the exterior brick veneer will start to go up and the new lecture hall will blend seamlessly in with the existing Magruder Hall. With all the major working happening at the clinic and lecture hall this week, things will be a little quieter at the LINAC addition. The only major activity over the next couple of weeks will be the framing. As we kick this week off with Presidents Day, our crew continues to blast through construction, like the blasts that created our founding fathers on Mt. Rushmore. Once again, the majority of the work this week will be happening at the clinic. The exterior stub walls are still going up and the footings for the entry vestibule (two door system entry) will be started and completed by the end of the week. The second floor will see the framing be finished out and plumbing, mechanical, and electrical rough-ins will be completed but the end of the week. Weather dependent, both the clinic and lecture hall could be some roofing action starting to take place. Also at the lecture hall, the exterior stub walls will continue to go up through the beginning of next week. Framing inside the lecture hall will begin early this week and carry through the beginning of March. The piping for the fire suppression system will be closed out by end of day, Wednesday. The slab edge form at LINAC as been pushed over into this week, the concrete pour is now expected to happen next week. If you have been by Magruder Hall, you’ve seen the major changes taking place with the new expansion. Over the upcoming weeks, this expansion will start taking shape as actually buildings and becoming an integrated foundation to Magruder Hall and the Veterinary College Community. In the terms of major milestones, the roofing for the clinic will start today, Monday the 11th. The installation of the exterior stub walls will also start this morning. Then, the clinic will also continue the interior framing from last week, which will also continue over to next week. HVAC will also start on the first floor of the clinic with the installation of the supply and return ductwork. There will be fewer activities taking place in the lecture hall with only the continuation of the framing installation on the schedule. LINAC will see a multitude of activities with continuing the plumbing and electrical slab rough ins from last week. Starting mid week will be the preparation under the slab overhang and rounding out the week with setting the slab edge form to prepare for the slab pour early next week. Make sure to check out the photos for a SNEAK PEEK at the interior of the clinic and LINAC addition! The majority of the site work will take place around the clinic this week. Continuing on from last week, the crews will be prepping for the vestibule footing prep and the interior framing. New this week, the fire suppression system will begin to be installed. The lecture hall framing will also continue and the slab on grade mechanical, electrical, and plumbing rough in at LINAC. While the to-do list is short this week, these are major components of the Magruder Expansion and we’ll start noticing more physical changes in the project. At the clinic, crews will be prepping for the footings for the vestibule, which is essentially an antechamber, hall, or lobby next to the outer door of a building. In which, a chamber or channel opening into another. Also happening this week at the clinic, you will notice that the exterior framing will start to go up. The lecture hall will also see framing happening this week. As well as, the installation of the roof deck. A roof deck consist of the roofing material between the structural components (the trusses and joists) and the insulation and weatherproofing layers (roof materials, coatings, layers, etc.). The roof deck is such an important part of a building because its the overall backbone of the complete roofing system. Carrying on with framing, LINAC exterior framing will also be going up this week. As the OSU community enjoyed a extended weekend in celebration of Martin Luther King Jr. Day, Monday the 21st, Fortis and their team were hard at work continuing with the Magruder Expansion. The next several weeks are planned to be very busy over the three site locations and tying in with the existing Magruder Hall. At the clinic, T. Gerding will be working on the exterior stub walls. While WPI will finish out the exterior framing of the east side of the clinic today and complete the south side framing from Wednesday through Friday. Overlying the entire week, WPI will be installing exterior sheeting which is planned to carry over to next week. Hammerquist plans on finishing up the rain drain piping on the first floor by mid-week and start the rain drain piping on the second floor. Finally at the clinic, Pacific Excavation will begin digging for the vestibule, which is a small room next to the outer door and connecting it with the interior of the building. Over at the new lecture hall, T. Gerding will be installing the exterior stub walls. Also, Corona will continue with the structural steel installation for the entirety of this week and next. Finally the conduit for the feeders should finish up early this week. The focus at LINAC during the beginning of the week will be tying up loose ends. T. Gerding will finish placing the slab rebar and working on the slab edge form. Also the plumbing and electrical rough-in should be complete by the end of day on Wednesday. Then the final slab prep for the under overhang will be completed for the concrete slab pour on Friday, the 25th. Please keep an eye for the concrete trucks in the hospital parking lot on this day. In the existing Magruder Hall, running wires for J-hooks and installing J-hooks will take place over the next week and a half. Also, make sure to stay up to date with the 4-week schedule outlook and site photos! Today, Monday January 14th, 2019 marks some important milestones in the construction of the Magruder Expansion. Starting today, the concrete pour will begin for the clinic’s slab on metal deck roof, which is expected to continue into Wednesday. Also, the start of the structural steel for the lecture hall. Installation will begin on Wednesday and continue through the end of January. In other events for the Magruder Expansion- the beginning of the week at the clinic exterior framing for the north side of the building will be completed and moving into exterior framing of the east side of the building which will run through the beginning of next week. It’s currently expected that the exterior sheeting installation that begins today will carry into at least the beginning of February. Lastly at the clinic, work for the rain drains will be completed midweek. At the lecture hall, the majority of the focus is centered around beginning the installation of the structural steel. At the end of the week, work will start on installing a new 12″ storm line for the lecture hall. The site of the LINAC addition will be busy this week, continuing from last week; the LINAC walls will finish out being stripped, by the end of the week the plumbing and electrical concrete rough-ins should be complete, and continuation of working on the slab edge forms. Working with the existing Magruder Hall, this week they will be tying into the existing water and running new electrical conduit down the hallway by the lecture hall. Make sure to stay up to date with the current schedule and work site photos! With the New Year falling on Tuesday this year, the construction team will be taking the day off to spend with their families, as the university will also be observing this holiday. Throughout the rest of the week, the completion of the structural steel for the clinic will be a main focus as they prepare to move onto laying the rebar for the slab on metal decking. At the same time, they will be roughing-in the mechanical, electrical and plumbing for the SOMD (slab on metal decking). The purpose of adding the reinforced rebar to the concrete slab on a metal deck is to add structural stability. Decking acts as an effective lateral restraint for the beams and can be designed to redistribute wind loads during construction. Steel is also known to be more sustainable, as 94% of all steal from a demolished building can be reused or recycled. The speed of construction is also greatly effected by using decking, on average 400m^2 of decking can be placed and installed by a single team in less than one day. For more information about the use of steel decking, check out Composite Slabs and Beams using Steel Decking: Best Practice for Design and Construction. The Lecture hall will continue to see the brick CMU walls to be built to create the exterior. Except this to continue through the middle of next week. The LINAC addition will see some action as the roof will be getting framed and prepping for the slab on grade concrete pour.